18 cm of textual records. 1 scrapbook. Originally known as the Ten Monday Nighters to represent the club’s ten founding women and the day on which they met, the group formed with the intention of saving money for the purpose of vacations, weekend trips, and personal enjoyment. The women also used wool supplied by the International Order of the Daughters of the Empire (IODE) to knit socks which the IODE then sent the Whit- Knit Club was formed in October of 1940 for the purpose of knitting socks to send to Whitby’s soldiers fighting overseas during the Second World War. The name was later changed to the Whitby Knitting Club, more commonly known in the community as the Whit-Knit Club. The club held a charter under the War Charities Act for the duration of the War and received funds from the Department of National War Services in order to supplement their own fundraising. The women contributed 50 cents a month in dues and regularly cut lawns, babysat, and organized dances and card nights to raise money for the purchase wool. In addition to these fundraising efforts, the club received donations from Whitby’s businesses and citizens. As funds started to increase, the club found they were able to send goods in addition to their trademarked yellow-banded socks. Eventually, a standard parcel prepared by the Whit-Knit Club included a carton of cigarettes, a large chocolate bar, and razor blades. All packages also included a letter updating the soldiers of the news in Whitby. Following the end of the War, the women decided in a meeting on May 22, 1946 that the club’s charter under the War Charities Act would not be renewed and the remaining funds would be donated to the Christie Street Veterans’ Hospital in Toronto. 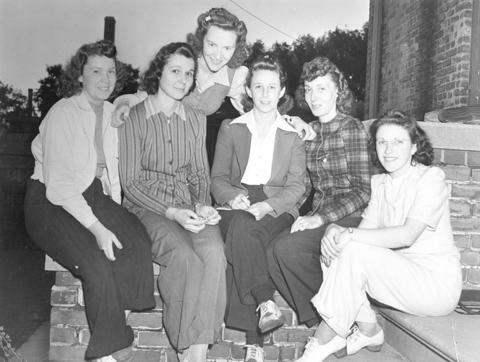 The Whit-Knit Club officially ceased operations on December 17, 1946. These records were acquired by donation from an unknown source. Fonds consists of records generated by the members of the Whitby Knitting Club. Records represent club operations associated with fundraising, knitting, distributing packages overseas, and the resulting incoming and outgoing correspondence. Fonds consists of two series: Administrative records and Correspondence. Records are protected by Copyright. Where copyright exists, materials cannot be published without permission from the copyright holder.